Last night I made the toughest decision of my Big Year. It was not made easily. I decided NOT to chase the Dusky Thrush in Anchorage. Please let me explain. The last several days on Adak have been rather uneventful. I’ve scanned through the ducks at Clam Lagoon a dozen times hoping for a Smew, Common Pochard or Spot-billed Duck. I’ve driven up to Andrew Lake at least ten times hoping against hope that the swans might be there, but I had little confidence in this. I’ve also checked all of the small evergreen stands near Adak for finches or buntings. In fact on Wednesday, I was rewarded with a Pine Grosbeak, which is apparently a 1stsighting not only for Adak, but for the Central Aleutian Islands. I also found a Pine Siskin as well which is casual on Adak. Heck, I would have been happy with just a Hawfinch. Then yesterday at 1:00 PM things got very interesting. Isaac Helmericks called from work with two bits of news. One of his coworkers had just spotted twelve Whooper Swans flying over town headed south towards Finger Bay and the Dusky Thrush had been relocated in Anchorage. I decided right then that if we saw the swans then I’d delay my flight out of Anchorage and try for the Dusky Thrush on Friday. There was a chance I could parley these two additional year birds together with a Great Skua, Hooded Crane and Nutting’s Flycatcher and end the year at 746. If I chose to skip Christmas altogether there was probably even time to add the Miami area White-cheeked Pintail currently being reported on e-bird as #747 (just to compare apples to apples with Sandy Komito’s White-cheeked Pintail in 1998). Anyway Isaac rushed over, grabbed me and we sped off in his truck to franticly search Finger Bay and the surrounding waters…but no dice. After I checked in with my luggage and with two hours to spare before my flight, I ventured out for a final hail Mary and searched everywhere for the swans one more time. When I arrived in Anchorage I consulted with White Keys. After several painful minutes, I decided to continue with my plans. So I’m on a plane bound for Anchorage where I’ll catch a red-eye to Seattle then a morning flight home to Denver. I’ll celebrate Christmas with Linda and friends in Colorado, then leave Monday morning for Hatteras. Seven days on Adak just sucked too much time out of the remainder of my Big Year. I wish to thank Isaac and Crystal Helmericks (and cute little Rhianna) of Aleutian Outfitters for their hospiltality. You’ll be home for Christmas, and not just in your dreams! What a story and what a roller-coaster! 741 is incredible, but I’m sure I’m not the only one who was quietly hoping to see another number up there when I refreshed your blog page today. At least this way you’ll be able to enjoy a nice Christmas at home. Wishing you a Merry Christmas and more magic in the final week of the year. Just wanted to leave a note thanking you for these wonderful posts. I wish you a very Merry Christmas and a 746 before New Years. But either way you’ve allowed us to live this dream with you. I sure hope there’s a book in the future for all this. John,, I am so pulling for you.. You will make it ..you will make it.. you will make it.. It has been a joy reading your posts. This has been a fun ride, no matter the end point. But I can’t believe there isn’t a Streak-backed Oriole out there with that Nutting’s Flycatcher! 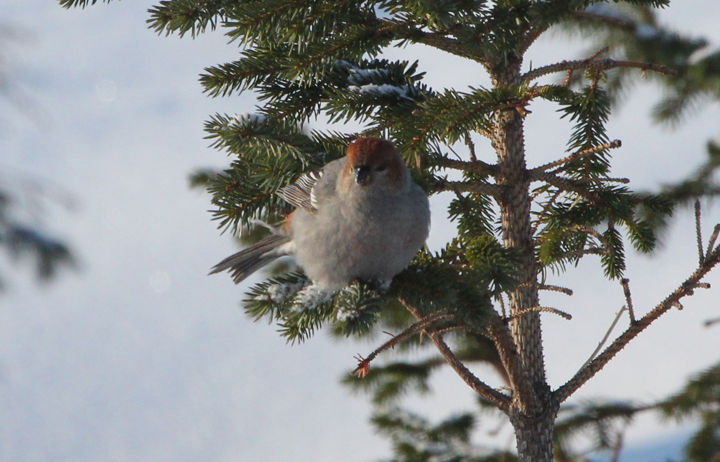 Congrats on the first Pine Grosbeak! I am sorry about the swan… You gave it a hell of a try. John, four people seen the Dusky Thrush yesterday, and at least four more today. The dusky is preening itself, and is not being hasseled by other birds. It is with a group of 50 robins. We will try keep tabs on it each day. Just in case it fits in your schedule. Be proud of yourself, we are all proud of you. Merry Christmas! Thanks for letting us be part of a great adventure this year. It’s been a blast. I hope you’ll come to Hiawassee for the hooded crane. I’ll trade refreshments for stories any time! Many thanks for allowing the rest of us, birders and non-birders alike, to enjoy this wonderful adventure with you. Your trip blog has provided thousands the opportunity to participate on a journey that most people can only dream of ever doing. Grab one more-make it close anyway! Sometimes its the journey, not the destination. Hell of a run, anyway it turns out. We are with you all the way! Merry Christmas! and heartfelt thanks for your very many posts through the year. And our very best wishes too for your last outings this next week! Have enjoyed your posts and am still rooting for. Have a lovely Christmas at home and then on for the next five!